I found the color to have tinges of grey and olive, which were not quite what I wanted for my warm, yellow-toned skin. Once applied, the undertone was still vaguely noticeable, so I don’t think 2.0YG is an excellent color match for me. A little tinted face powder helps to swing the undertone back in my favor, but I’d certainly prefer a closer color match. The hints of gold highlights are very subtle, so it isn’t as though you’ve just applied highlighter all over your face. The Serum Foundation needs to be shaken before use. The oil-free formula has a very smooth, liquid consistency and a slick feel thanks to silicones. Applying this foundation was easy with either my fingers or a makeup sponge. I didn’t have a preference either way, but I did get the best finish with a slightly damp sponge. The formula is well-pigmented, so a little does go a long way. It spreads across the skin very thinly, easily and evenly. The foundation set to a semi-matte finish, as expected. I have not tried any other shades, so unfortunately, I can’t really compare this shade with gold highlights to a shade without highlights. It doesn’t look totally flat and matte on the face, though, which is a plus for me. However, the formula sets to a very dry finish, making it look a tiny bit mask-like. My skin is normally dry, although I have been using several layers of serum and moisturizer morning and night, and my skin has become much better hydrated. (Plus, it’s warm out now that it is summer!) This foundation appeared to undo some of that, and made my skin look tighter and less hydrated. 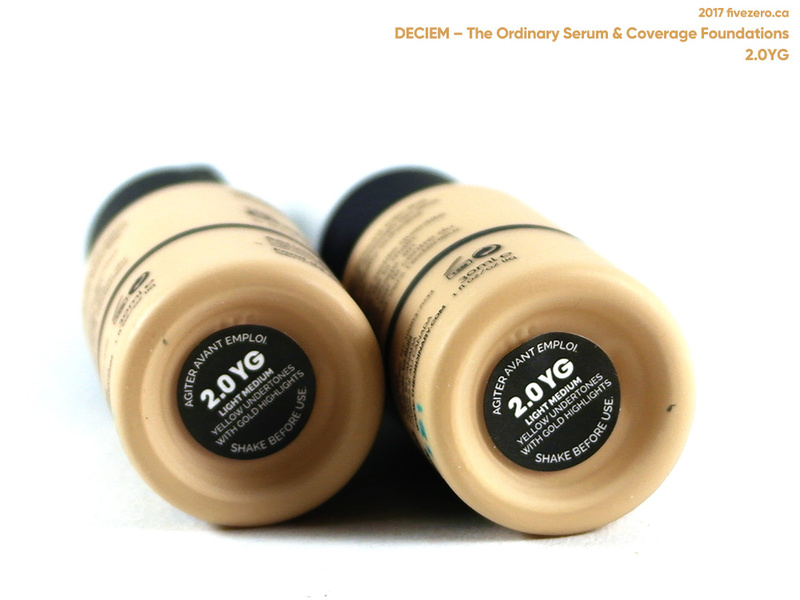 Coverage is certainly medium, as DECIEM claims. 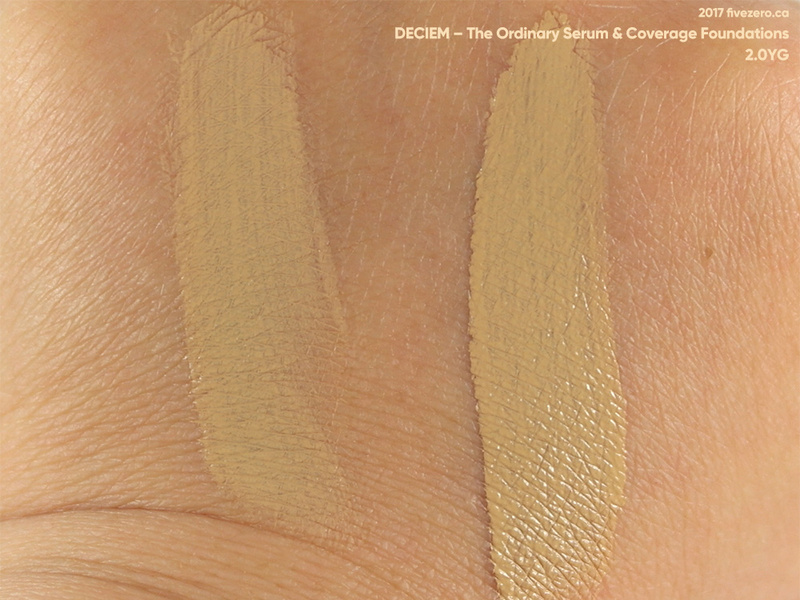 It has the consistency of a light coverage foundation, with the coverage of a medium. I love that. My dry skin doesn’t usually have much trouble with foundations staying on, and I didn’t have any issues with the Serum Foundation. I did powder it a little on top, and throughout a couple of warm, sunny days, the foundation wore well for at least 8 hours. 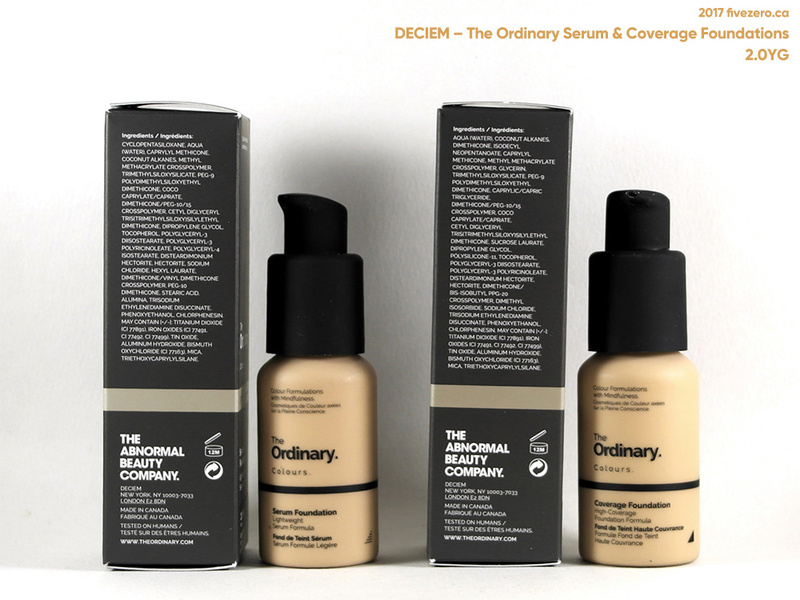 Both the Serum and Coverage Foundations are packaged in identical 30 mL plastic bottles with pump dispensers; there is no cap included. Despite their very low price (CA$6.70), the packaging is quite pleasant in its simplicity. The bottle and pump have semi-matte textures themselves, which is a nice touch. A pump isn’t the ideal method of dispensing such a liquid-y foundation, and a little always dribbles out of the dispenser after each pump. No biggie, though DECIEM do offer a glass dropper that can be purchased separately. Due to the color being a touch too grey and olive for my skintone, I would not repuchase the Serum Foundation in 2.0YG. I’d be open to trying another shade, but I don’t particularly like the drying effect this formula seems to have on my skin. It’s tempting to want these products to work since they are so inexpensive and seemingly well-formulated, but I’ll have to pass on the Serum Foundation. 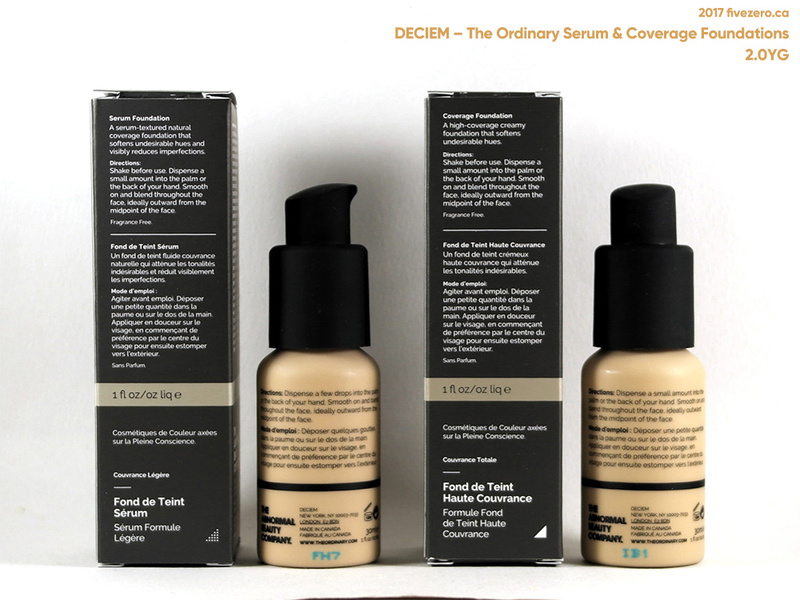 Have you tried Deciem’s newly-released foundations? 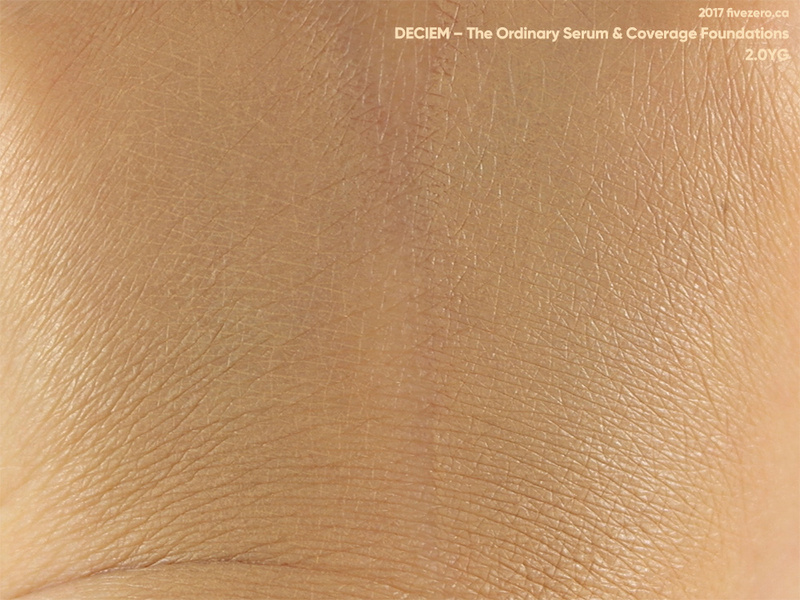 DECIEM The Ordinary Colour Serum Foundation contains 30 mL and retails for CA$6.70. The formula is free of alcohol, oil, nuts, and soy. The company is cruelty-free and vegan. 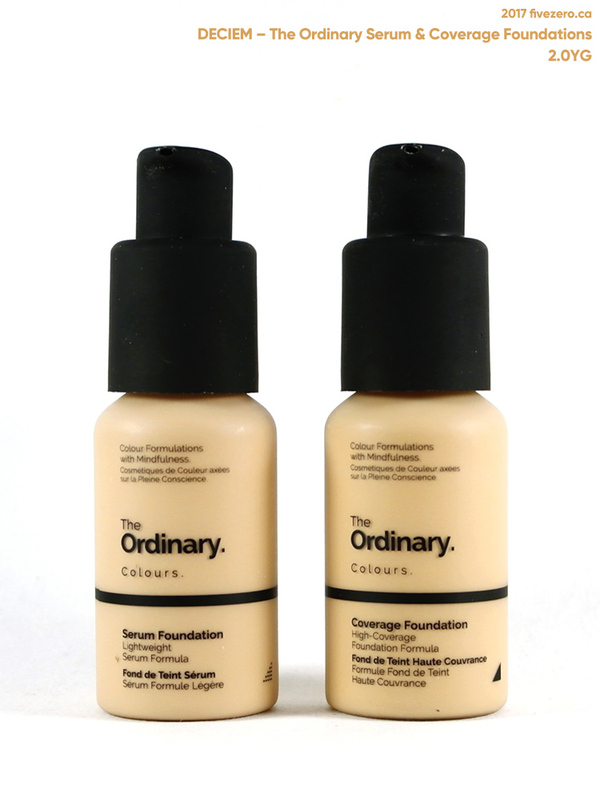 I actually thought this foundation came in a dropper bottle – that’s what I always assume with these types of serum type foundations. Looking forward to seeing the Coverage foundation. I can’t believe it! How did you stop yourself?! LOL. I definitely want to try another shade – probably in the Coverage line. 2.0N is the one I’m eyeing up. Not sure I’ll have the opportunity to swatch in-store…though I guess that one in the Financial District should be opening soon, shouldnt’ it? I wonder if the highlights would show up in flash photography. Ooh, that is an interesting point. I’ll give it a try on my hand next time I’m swatching! Actually, the small amount of titanium dioxide in it would probably show up, too. I mean it kind of makes sense with foundation doesn’t it? Not so much flashback from the SPF (since it’s only 15) but from the highlighter. I remember swatching the Revlon Photoready foundation and ending up with with specks of micro glitter on my hand which was visible under bright light. Oh yes, I am not crazy about foundations with sparkles in them. I remember trying one drugstore foundation (I forget which) and it literally looked like a highlighter when I had it on my hand. With this TO Serum Foundation, I can’t see anything sparkly in normal light, so it’s quite subtle. I notice a very, very slight sheen when it’s on my face, in brighter light. Too bad the shade was a bit off, but knowing people with olive toned skin I’m happy they offer colours in that range. I would be into trying this serum myself, sounds exactly like what Id want. Nice review. Now I just need to get myself to a store! It’s too bad for me, but good for anyone with olive undertones! 🙂 I am always wondering why makeup companies only ever seem to offer neutral, cool (pink), and warm (yellow) undertones, and nothing for olive skintones. That is too bad that the shade wasn’t right for you. Hopefully you will be able to find the right match! 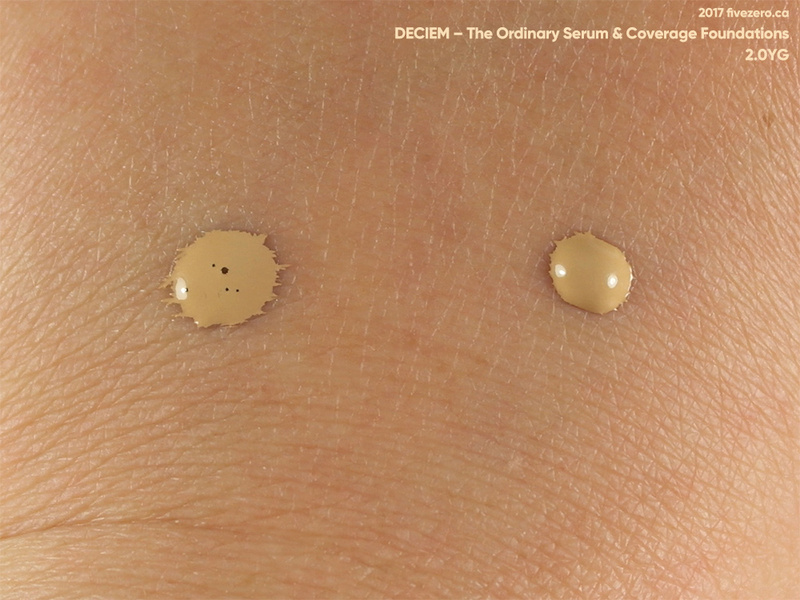 How ironic that the serum foundation is drying – I would have guessed that it’d be exactly the opposite. 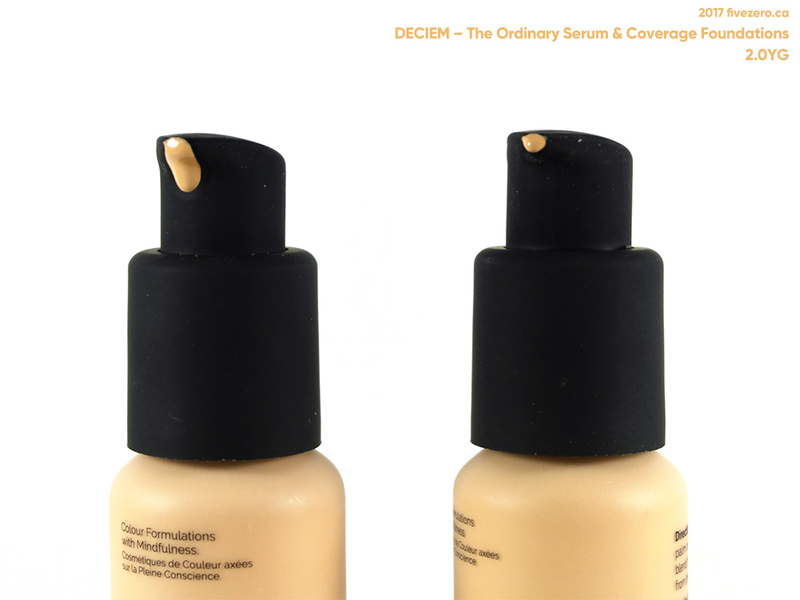 The Coverage foundation sounds promising though – looking forward to your review! It was very weird! Maybe I just have odd skin. LOL. I am definitely liking the Coverage Foundation better, and hope to review it next week. I have dry mature skin and I love the skin serum. It goes on sheer and I can build up the areas I want. Stays perfect all day for me. I’m glad it worked out really well for you! I wonder if the wear on mine didn’t work out as well due to my sunscreen or some other layer I wear under my foundation.